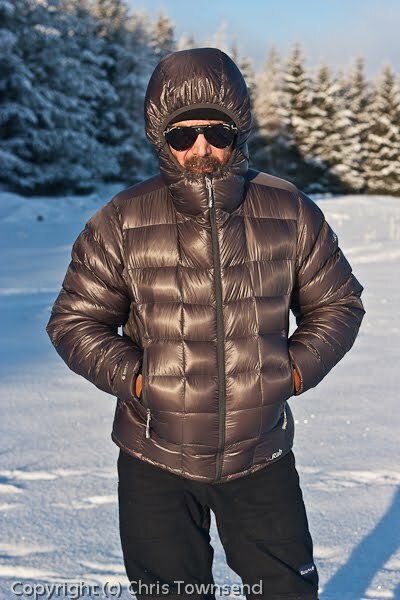 A down jacket has been ideal for keeping warm in the freezing weather of the last five weeks. 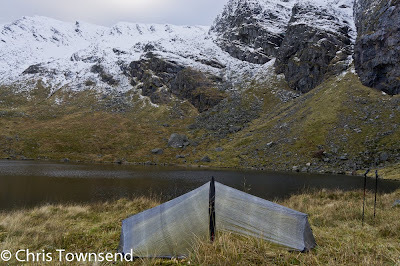 A new one on the market this winter is the Rab Infinity, which I've been testing. My review is now up on the TGO website here. Photo info: the Rab Infinity keeping me warm in freezing weather in Strathspey. Canon 450D, Canon EF 50mm f1.8 lens, 1/1000@f4.5, ISO 200, raw file processed in Lightroom 3. A huge, remote and lonely moorland plateau lies to the north of the Cairngorms, filling the massive roadless area between the A9 road in the east and the Great Glen in the west. This is the Monadh Liath, the grey hills, an area of rolling heather upland with vast skies and an awe-inspiring sense of space and wild nature. In the heart of the area is the Dunmaglass estate, bordered to the west by one of the remotest Corbetts (peaks between 2500 and 3000 feet) in the Highlands, Carn na Saobhaidhe. Although not distinctive in itself this flat-topped hill gives extensive views all around, across the Monadh Liath to distant peaks. There is an amazing feeling of being deep in the wilds and far from the works of humanity. It’s a place for solitude, reflection and peace. But it won’t be for long. Today the Scottish government gave permission for an enormous wind farm on the Dunmaglass estate. Thirty-three giant turbines will tower above the landscape over a four-mile square area, each one linked by power lines and bulldozed roads. The landscape will be industrialised, ripped apart, trashed. To what end? 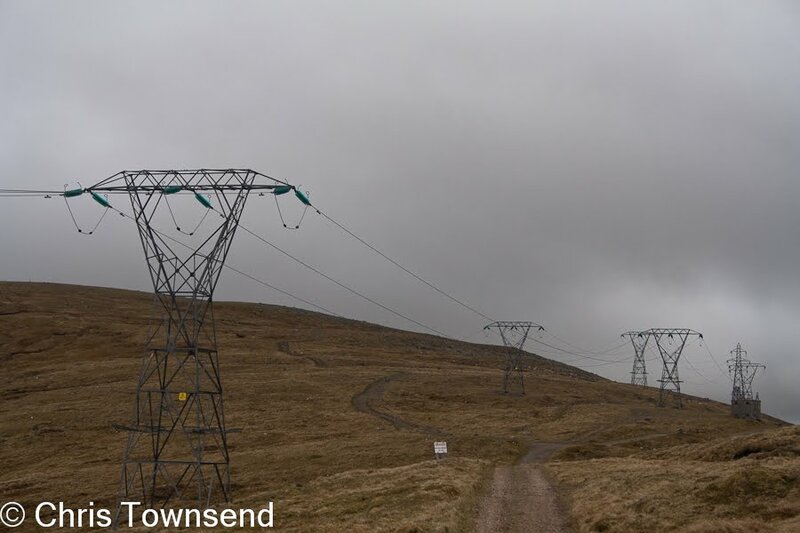 “Green” power says the Scottish government, which begs the question as to why here when there are many other possible sites and also as to just how useful wind farms are when they produce no power during periods of calm, cold weather such as we’ve had the last month. Money says absentee estate owner Sir Jack Hayward, who will pocket millions without raising a finger or spending a penny. Money too, says RES, the company behind the wind farm who will benefit to the tune of £120 million from the tax payer. And so that the 1/125th richest man in Britain, who already has £160 million, can become even richer in his Bahamas tax haven and a construction company, part of the McAlpine group, can make even more money a unique and beautiful area of wild land will be destroyed, along with the wildlife that lives there. I find this sickening, appalling and depressing, an act of barbaric vandalism. It’s also worrying because if this is how the Scottish government responds to this application what will happen to other applications for environment-destroying wind farms? How much more will we lose? 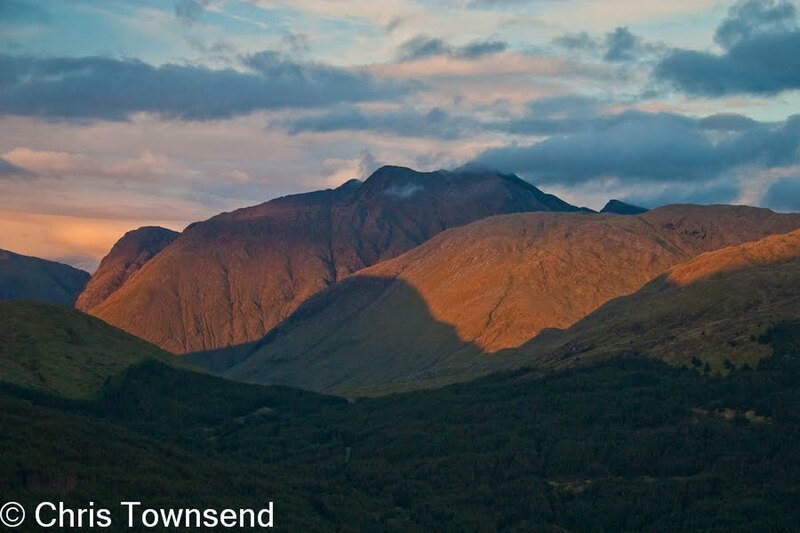 The Dunmaglass wind farm was opposed by the Mountaineering Council of Scotland (you can see our objection here) and the John Muir Trust (objection here). This is a defeat but we have to fight on and it’s through these organisations that we can do so. Please support them. Late night edit: excellent posts on the Dunmaglass obscenity by Cameron McNeish and Alan Sloman can be found on their blogs here and here. 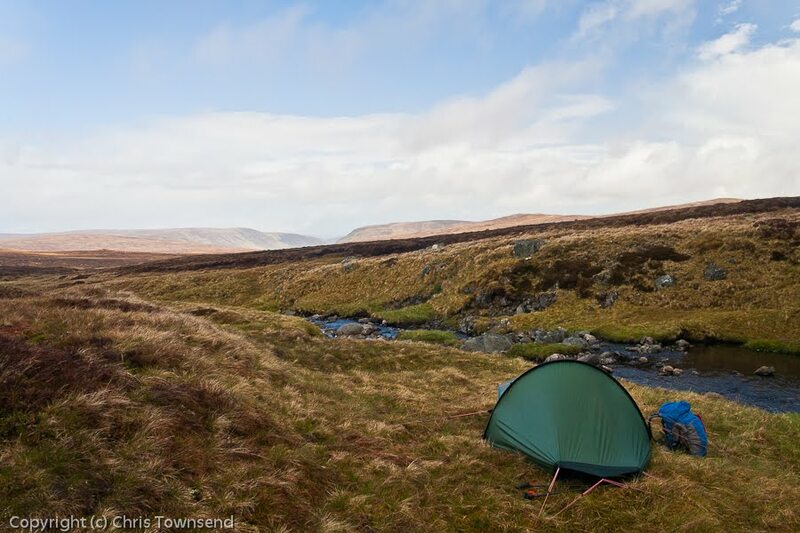 Photo info: A wild camp on the Monadh Liath. Canon EOS 350D, Canon EF-S 18-55@21mm, 1/80 @ f8, ISO 200, raw file converted to JPEG in Lightroom 3. Looking back at the new gear I’ve tried for the first time this year a number of items stand out. Unsurprisingly many of them were used on my Pacific Northwest Trail walk over the summer. This is a great cooking system that I really enjoy using, especially as a wood burner. Lightweight, compact, efficient and works whatever the weather. On the PNT I used it mostly with wood for the first 6 weeks and then with alcohol most of the wet final month. It worked fine with both fuels. Despite it springing a leak on the PNT this airbed became a favourite due to the comfort, light weight and low packed bulk. POE have replaced it with the Peak Elite AC. I have one on test and will be reporting on it for TGO soon. This eVent waterproof smock kept me dry on many wet days during the last month of my PNT walk and was light and compact to carry during the first six weeks when it was rarely needed. I think it’s an ideal waterproof top for long distance backpacking. These roll-top, seam-sealed, silnylon waterproof stuffsacks are superb. I don’t like pack covers and prefer to pack gear into waterproof bags inside the pack. These stuffsacks, which seem identical, are lightweight and tough. They kept my down quilt and jacket, spare clothing and other water-sensitive gear completely dry on the PNT. With this unit, which fits neatly into Petzl’s Tikka, Zipka and Tikkina headlamps, the output and the battery life can be programmed and the headlamp used in regulated mode so the power remains constant. There’s some clever software so you can adjust the modes on screen. I’d have taken this on the PNT if I’d had one then. I used this pack on the second half of the PNT and came to really like it. I’d used the Odyssey with the same back system as a winter backpacking sack for a few years so I knew it was comfortable. On the PNT I felt the Quest was an ideal combination of size, light weight and comfort with moderate loads. In the Scottish hills I don’t bother with water treatment. But in some places abroad it’s essential. On the PNT some sections were in ranching country where every water source had been trampled and muddied by cattle. I used this little UV light purifier to treat this water and never got sick so I guess it worked. No chemicals are involved and no complex, slow to use filtering either so when I have to treat water this is the purifier I would choose. On the PNT I wanted to minimise the number of devices I carried so I took a smartphone with GPS plus ViewRanger software with US topo maps. This was a great success on the many occasions when I needed to locate my position in dense forest. This camera takes better quality pictures than my DSLR whilst being much lighter and more compact and so is better for backpacking. I wish I’d had it for the PNT. I’ve been wearing this lovely, snug down jacket a fair bit this cold autumn and winter. It’s lightweight and packs small and so is ideal for cold weather backpacking. A detailed review will appear on the TGO website early in the new year. 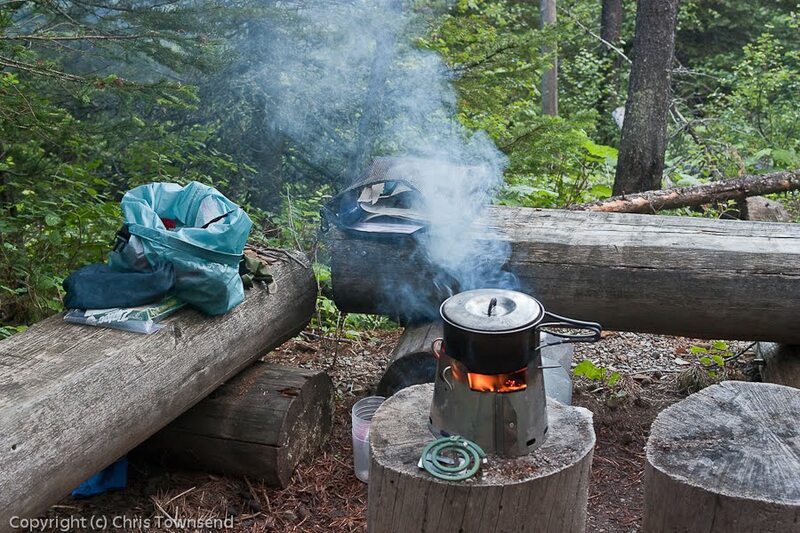 Photo info: the Ti-Tri Inferno in use at Waterton Lakes campsite in Glacier National Park during my Pacific Northwest Trail hike. Canon 450D, Canon 18-55mm lens@28mm, 1/60@f5.6, ISO 800, raw file processed in Lightroom 3. The River Spey in Strathspey is wide and fast. It doesn’t freeze easily and even after three weeks of mostly below freezing temperatures the river is still running strongly with ice confined to the margins and quiet pools and eddies. The water is dark, flashing silver when it catches the light, but the rocks that break the surface and the reeds and grasses in the shallows by the banks are white with hoar frost and snow. The banks are wooded and the leafless trees are also snow covered. Underfoot the snow crunches and the paths are only visible as tunnels running through the woods. Out on the water whooper swans drifted with the current or stood on patches of ice and rocks. I heard them calling before I saw them, a high trumpeting that gives them their name. A dozen or more were on the river and their calls grew much louder when four more wheeled overhead, their huge wings beating slowly. A tiny movement attracted my attention away from the great white birds – a tiny dipper, plumped out against the cold, bobbing on a rock, watching the swirling water. Also on the river were mallard ducks, paddling sedately in a calm backwater, then clambering out onto an ice floe. With the lakes freezing over and the hard frost continuing water birds need the open water of the rivers. 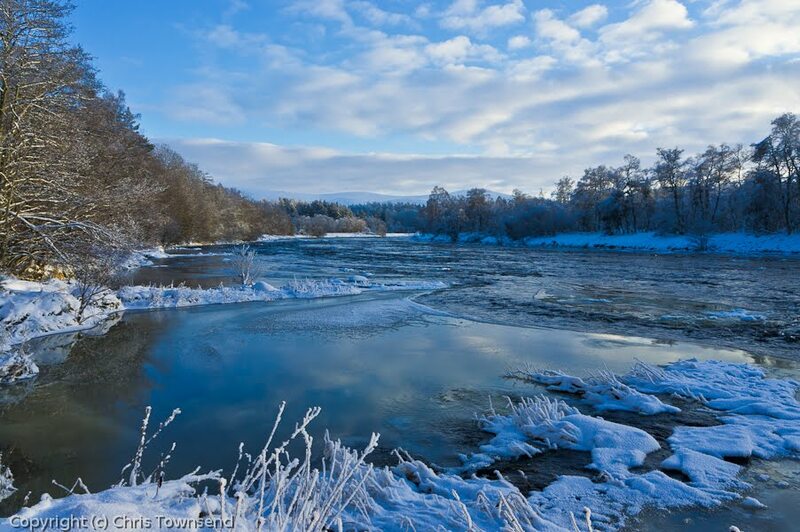 Photo Info: Top: the River Spey at Grantown-on-Spey; bottom: whooper swans on the River Spey, December 23, 2010. Sony NEX-5, Sony 18-55 lens@18 & 55mm, 1/200 & 1/160@f8, ISO 200, raw files processed in Lightroom 3. A snowy winter landscape is mostly monochrome. There is little colour, often no more than the subtle patterning in the rocks or the dull dark green of conifers. At a distance trees and boulders look black, etched against the pale snow. When the sun shines the blue sky adds a wash of cold colour above the cold whiteness. Twice a day though there is the possibility of brilliant red and vivid orange searing across the sky and suffusing the landscape with warm colour. 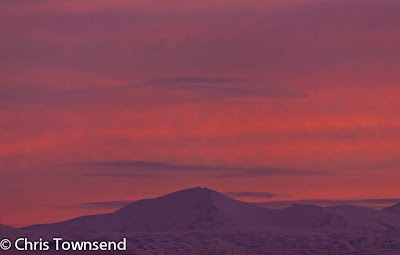 At dawn and dusk the rising and setting sun can light the clouds and cast a purple tinge over the white mountains. That has been the case several times in the last few weeks and many dull, cloudy days have ended in a blaze of hot colour belying the freezing temperatures. Such sunsets and sunrises occur when there is no snow of course but the cold and the snow makes them seem more intense and powerful. 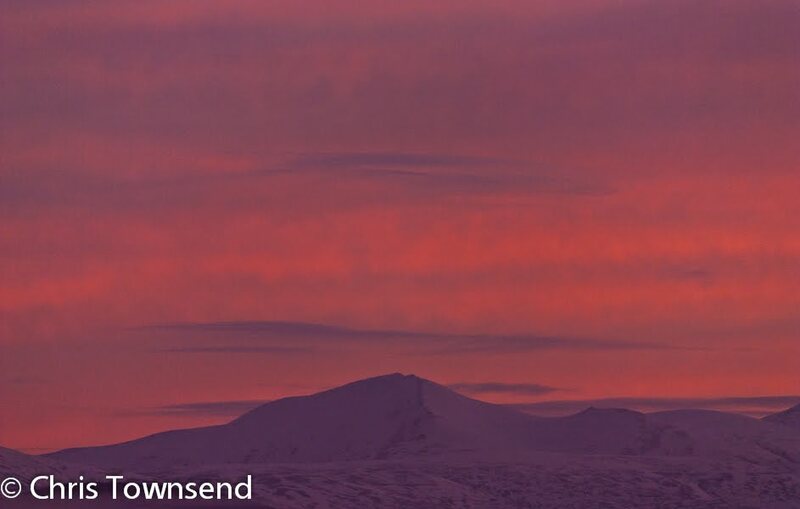 Photo Info: Dusk over Bynack More. Canon EOS 450D, Canon 55 -250 lens@250mm, 1/250@f5.6,ISO 800,raw file processed in Lightroom 3. A brilliant sunset with the snow-covered mountains sharp against the sky had me longing to be skimming over those summits on skis. The forecast was mixed and somewhat confusing, with a threat of complete cloud cover but the promise of superb visibility. Wind speeds would be low and precipitation unlikely. The next day the clouds were there but patches of hazy blue sky suggested clearances were possible. I decided to be optimistic and set out up towards the Cairngorm Plateau, the climbing skins on my skis sticking firmly to the crunchy, crusty snow. Soon I was entering the cloud and the hints of blue had faded. The chilly breeze became a cold wind bringing sleet and drizzle. I zipped up my jacket and pulled up the hood. The sleet became heavier and soon froze on my clothing and pack. The slope grew steeper, the snow icier. The skins started to slip, a backwards jerk that tugged at the groin. A ski pole skidded off hard ice. Finding a flattish spot beside some rocks I decided crampons made more sense than skis. Changing from one to the other was not a simple procedure however. Balancing on one ski I unclipped my boot from the other one and slid it into the crampon whilst the wind whipped the sleet against me. Threading the crampon strap through the attachment rings and tightening it was finger-freezing work, my thin gloves inadequate for warmth and becoming wet from the sleet. I was glad I didn’t have the multi-strap crampons of old. Finally I had both crampons on and felt more secure as they bit into the icy snow. My fingers grew colder as I strapped the skis to my pack and swapped a ski pole for my ice axe. Setting off I regained some warmth with the effort of climbing and of resisting the wind which caught the skis and tried to blow me sideways. The cloud thickened, the sleet grew denser, the wind strengthened. All I could see was the white slope rising ahead and the occasional rock. Head down against the stinging, scouring, freezing, wind-blasted wet sleet I struggled on for a short while then stopped. I hadn’t reached the plateau yet. The wind would be stronger there, the visibility no better. These weren’t the conditions or the place to ponder long. Once the thought of turning back had occurred I knew it was the right thing to do. The wind was behind me, out of the north-east. I faced into and began the descent, relying on the points of my crampons to prevent me slipping. Once I reached the softer snow the crampons sank in and caught on rocks and bits of ice, becoming more of a hazard than a help. Time for the skis again. Changing back took even longer as the straps on my crampons and pack had frozen and had to be rubbed between my fingers before they would slide through the buckles. I ripped the skins off the skis and stuffed the wet, half-frozen bundles of sticky nylon into my pack. My gloves were sodden now and my fingers numb, a reminder of why I always carry several pairs in winter. Dry fleece gloves and weatherproof overmitts felt delightful. I skied carefully downwards, unable to see much detail in the snow and making big slow turns. The cloud base had lowered and I was still in it when I reached the car park. There was sleet here too and a colder, stronger wind than when I’d set out. The promise of that fine sunset had been false. I felt relieved at having turned back and surprised at how intense and demanding a few hours in a storm had been. 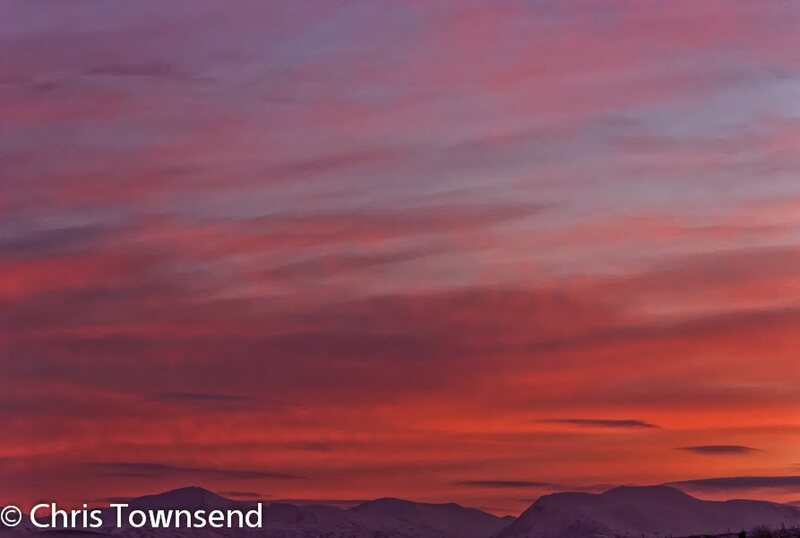 Photo info: The sunset over the Cairngorms that lured me out the next day with the hope of good weather. Canon EOS 450D, Canon EF-S 55-250@100mm, 1/400 @ f5.6, ISO 800, raw file converted to JPEG in Lightroom 3. 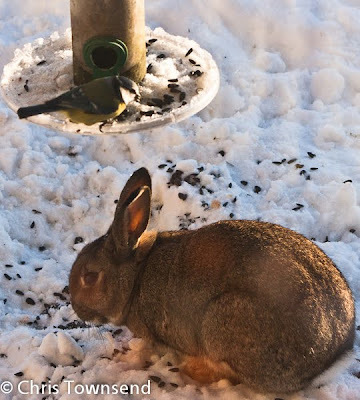 The deep snow and bitter cold has made life hard for wildlife. 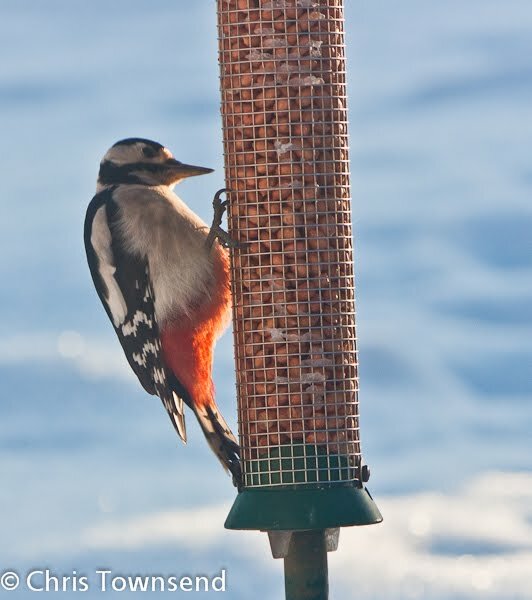 Within hours of the first snowfall the number of birds visiting the feeders in the garden soared and the amount of food consumed each day soon tripled. Animals have become tamer too and start to watch out for food arriving. The rabbit in the picture appears as soon as I go outside and comes within a few feet of me to feed. 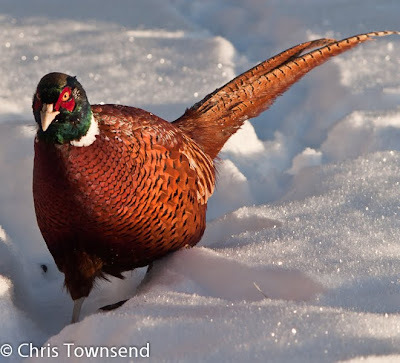 The pheasants come running on seeing me too. Ground feeding birds like robins and dunnocks make mostly futile attempts to hang on the feeders. That's one reason I scatter some food on the snow each day. Then the small birds have to dart in and grab seeds before the rabbits and pheasants gobble them up. These photos were all taken handheld through windows with the Canon 450D and 55-250 zoom lens on 400 ISO. 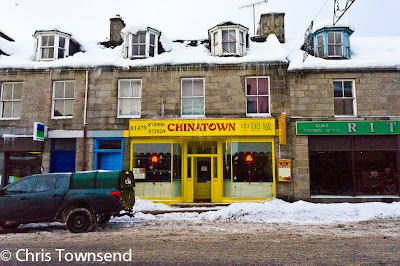 Yesterday I ventured into Grantown-on-Spey, half a mile on foot down a snowed-in track and five miles in the car on icy roads, for some needed supplies. 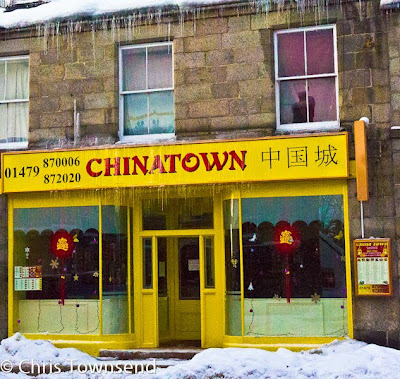 While there I took some photographs of the frozen town. 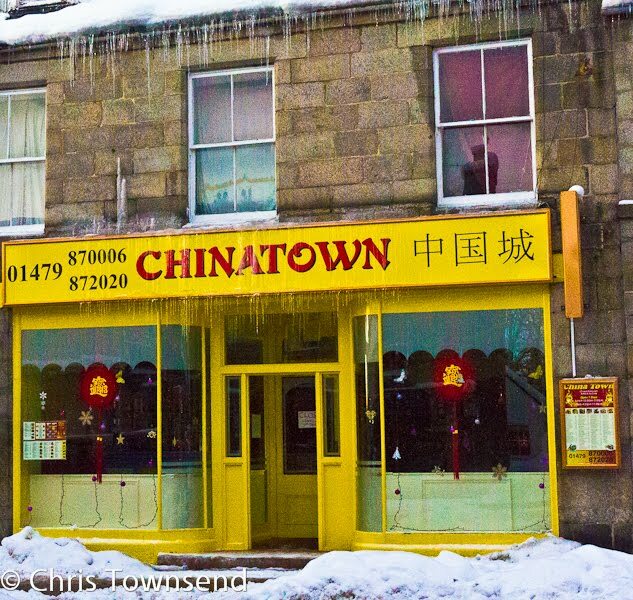 Much of the snow has been shovelled away now but there was still enough along with the icicles on shop fronts to give a wintry feel. With more snow forecast and no sign of a thaw for the next few days the town will continue to look and feel frozen. Again wanting to see what the results were like I shot the pictures at ISO 12,800 on the Sony NEX 5. Shutter speeds were 1/2000 and 1/2500 and f stops f11 and f18. The results are surprisingly good for the huge ISO speed, though there is much noise. I'm amazed at what this sensor can produce. The wireless office sounds a great idea but doesn't seem to have arrived yet. 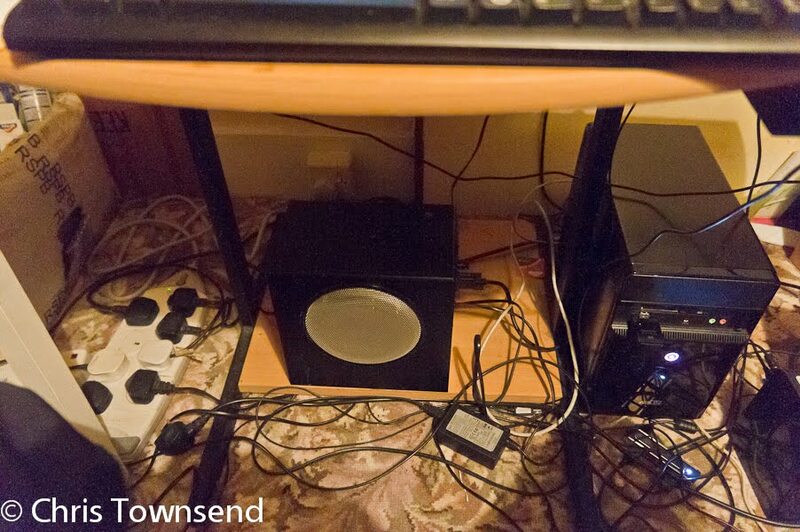 This photo shows the clutter under my desk. Just out of sight are a pile of chargers and cables for GPS, phone, cameras, headtorch and rechargeable batteries. What a mess! I actually took this shot while playing with the Sony NEX 5. It was taken handheld in low light at 1/30 at f3.5 at 18mm and ISO 12,800. It's noisy of course - about as noisy as a photo at ISO 800 on my Canon 450D or ISO 400 on the Ricoh GR-D compact. But this is ISO 12,800. Astonishing! With complete snow cover from my front door to the tops of the nearest hills and the roads icy and slow to drive a local ski tour seemed a good idea rather than heading for the bigger mountains further west. Packing a flask of hot ginger cordial and a down jacket in my daypack and digging out an old pair of waxless skis and my leather touring boots, with the supergaiters that have been on them for over a decade, I set off down through the woods and across the glen to little 484 metre Tom Mor, which lies at the end of a broad and rather indistinct ridge of rounded heathery hills at the north-east edge of the Cairngorms National Park. It’s a nondescript top but does give good views across Strathspey to the higher Cromdale hills and, further west, the Northern Cairngorms. Ironically, the name means big hill. In a straight line Tom Mor is less than three kilometres from my house. With a large boggy meadow, a stream, two minor roads, several fences and a dense plantation in the way that’s not a good route however. My more roundabout way was nearly three times as long but meant I didn’t have to remove my skis to overcome any obstacles. 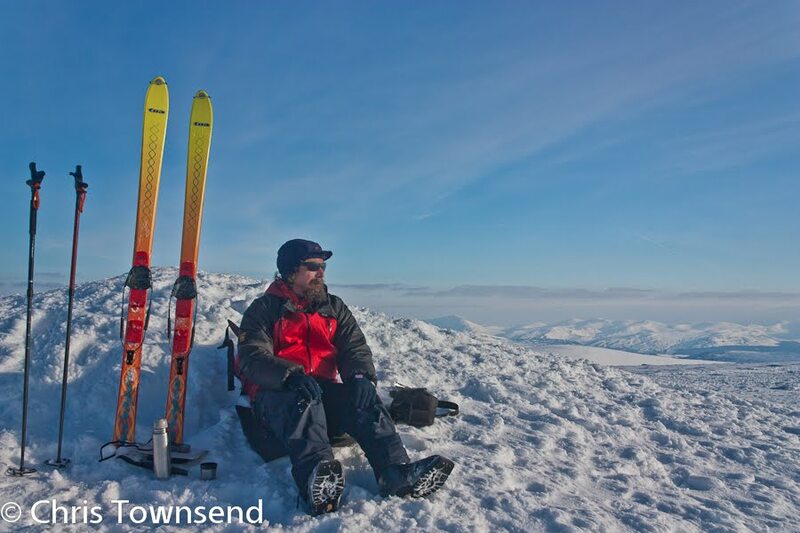 The snow was a mix of deep windblown powder which deadened and slowed the skis and crusty, icy snow over which the skis skimmed fast or else broke through and sank, sometimes knee deep. Higher up the wind had whipped the snow into undulating waves, some soft, some hard. The air was bitingly cold and on the summit a brisk wind had me feeling chilly as soon as I stopped. I was glad of that hot drink and the snug warmth of the down jacket. The weather was mixed with short periods of sunshine and patches of intense blue sky but also sheets of grey clouds and occasional flurries of snow. I didn’t linger long on the summit but was soon swinging down the wide snowfields below the summit, a more direct line than my ascent route. I would like to say I swooped down in graceful turns but the combination of crusty snow and my old gear meant I played safe and descended in a series of long traverses linked by slow, careful turns. Returning up the glen I had the best light of the day as the low sun shone under the clouds, turning the snowfields a delicate shade of pink. 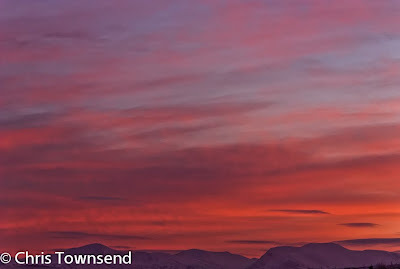 Photo Info: View across Strathspey to Carn a' Ghille Charr in the Cromdale Hills, December 5, 2010. Sony NEX-5, Sony 18-55 lens@55mm, 1/80@f8, ISO 200, raw file processed in Lightroom 3. 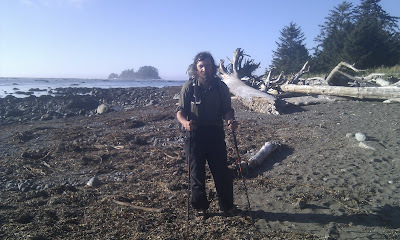 The latest TGO (January 2011) has the last of my Pacific Northwest Trail reports plus a feature on the gear I used and how it performed. There’s also a nice review of my Scotland book by Roger Smith. Elsewhere in the magazine Roger Smith calls for a national trails network for the whole of Britain, Emily Rodway interviews Nat Severs about his walk round the British coast, Andrew McCloy discusses the National Trust’s plan for fences on Kinder Scout and what that means for walkers and the landscape, Andy Stothert photographs a wintry Buttermere, Cameron McNeish explores Glen Etive, Andrew Terrill enthuses about bothy and hut life, Edoardo Albert visits Alderley Edge and Jim Perrin celebrates aimless wandering. In gear John Manning reviews socks and, like me, finds he prefers those with a high merino wool content, while Eddy Meecham convinces himself that an expensive customised Cuben Fiber tarp is justified. Photo: The Belly River valley in Glacier National Park near the start of the Pacific Northwest Trail. Canon EOS 450D, Canon EF-S 18-55 IS@24mm, 1/320 @ f8, ISO 100, raw file converted to JPEG in Lightroom 3. TGO magazine carries comparative gear reviews every month and occasionally individual reviews. Space is limited in a paper magazine of course and reviews may not appear for several months. Websites don’t have space restrictions and starting today some of my reviews will appear on the TGO website (which already has hundreds of reviews that have appeared in the magazine which you can find here). The first review is of the Paramo insulated Torres Sleeves. Photo info: Torres Sleeves in use on Beinn Udlamain. EOS 450D, Canon EF-S 18-55 IS@21mm, 1/200 @ f8, ISO 100, raw file converted to JPEG in Lightroom 3. 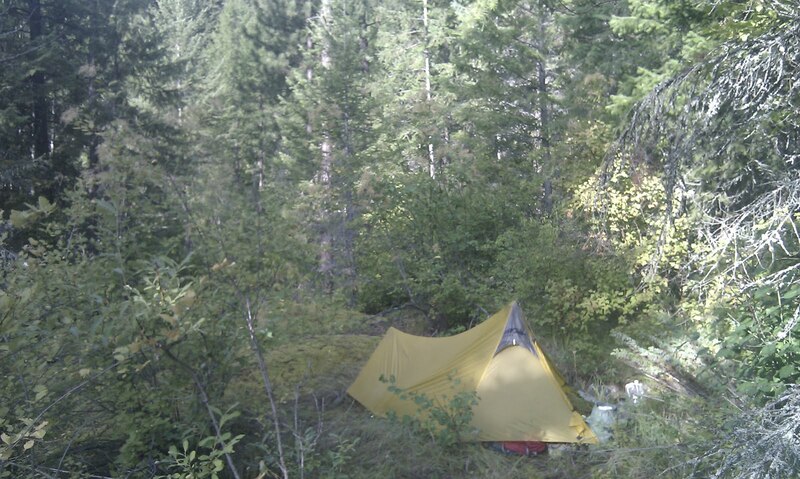 On the Pacific Northwest Trail as well as paper maps I used ViewRanger software with topo maps on an HTC Desire phone. This worked really well and made navigation much easier in difficult terrain like that pictured where I was sometimes hiking cross-country and was often on old little-used and obscure trails. I've written a short account of using ViewRanger for the ViewRanger blog which you can read here. 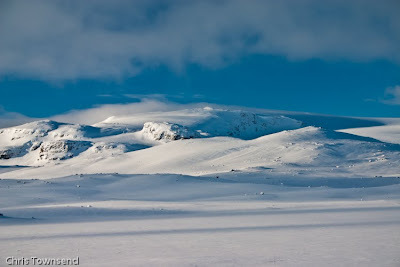 Photo info:The Purcell Mountains. Canon EOS 450D, Canon EF-S 18-55 IS@25mm, 1/50 @ f5.6, ISO 100, raw file converted to JPEG in Lightroom 3. The videos we made last week on winter clothing (see my last post) are now available on the TGO website. The first one covers layering systems, the second hats and gloves. As you can see the weather was suitably wintry when we filmed the videos. The temperature was below freezing and there was a chilly breeze to add to the realism. Also on the TGO site Deputy Editor Carey Davies has posted on his blog about the two days we spent learning about and making videos. Photo Info: -25C at the start of a ski tour in January in Yellowstone National Park. Ricoh GR-D 1, 1/100@f8, ISO 200, raw file processed in Lightroom 3. Winter has arrived fast and furious with blizzards, heavy snow, bitter winds, freezing temperatures and even thunder and lightning. Four days ago I woke to a few inches of snow. Today there is a level eighteen inches and several feet where the snow has drifted in the north-east wind. The morning of the first snow I drove to Newtonmore where I was going to learn about making videos along with the TGO editorial team. Our tutors were Richard and Meg of Triple Echo Productions, who have made many outstanding outdoor films, including last summer’s Great Climb, and who currently make BBC 2 Scotland’s Adventure Show. The first five miles to Newtonmore were on slippery roads that hadn’t been gritted but once on main roads there was little snow and in Newtonmore there was none. However it did snow that night and I woke the next day to a couple of inches. This was just enough to give the hills a wintry look for the video we made, in freezing weather, about clothing for winter walking. This video should appear, in two parts, on the TGO website sometime soon. 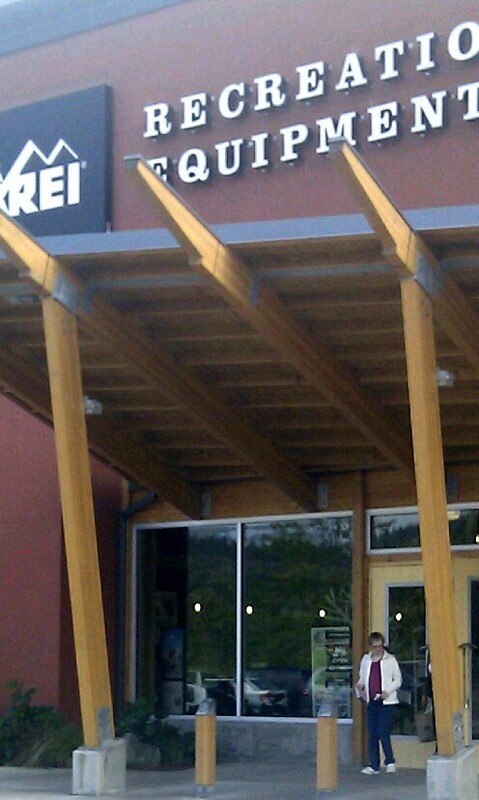 That evening I was due to give a talk on my Pacific Northwest Trail hike to the Inverness Nordic Ski Club. As I left Newtonmore late in the afternoon the snow began to fall heavily and the journey to Inverness took much longer than expected. I arrived in time to give the talk however. Then I had to get home. The main A9 road had a light covering of slushy snow but had been gritted and ploughed. Once I left it I was on deeper snow and roads that hadn’t yet seen a gritting lorry. Careful driving in the snow, which was now falling heavily, took me to the last two miles, which are along a single track road. The snow here was deep and my car was almost stuck several times. At times the front bumper acted as a crude snowplough, flinging up masses of snow onto the windscreen that temporarily blocked my view. If the snow hadn’t been very soft I wouldn’t have made it. As it was I finally slid into a passing place at the bottom of the track to my house and the car stuck firmly. So at 1 a.m. I trudged the half mile up to the house through knee-deep snow and a blizzard. Despite the late hour I lit the solid fuel stove as the temperature in the house was just +8ºC. Outside it was -6. The next day I stomped down the track on snowshoes to check on the car. It was now partly buried in fresh snow. The road still hadn’t been ploughed so there was no point digging the car out of its drift. Even with snowshoes on I was sinking deep into the snow and the going was hard. The woods were beautiful though with great gobbets of snow weighing down the branches. Today I went out on skis for a few hours and found that they were even harder to use than the snowshoes as I ploughed a knee deep furrow through the soft snow. There were few animals or birds moving. The snow was too soft even for them. I’d seen a pheasant wading through the snow in the garden, just its head and neck visible. High above the woods a buzzard mewed and a flurry of wood pigeons exploded out of one tree but otherwise the woods were silent. With more snow forecast and a hard freeze every night this could be the start of a long, cold winter. Or of course a warm spell could strip away the snow in a few days and leave the hills bare. But until then winter is truly here. Photo Info: Strathspey in the Snow, November 28, 2010. Sony NEX-5, Sony 18-55 lens@33mm, 1/400@f8, ISO 200, raw file processed in Lightroom 3. This is a book I’ve been meaning to read since it was first published last year, partly because of the many good reviews it received (it was short listed for the Boardman Tasker Prize for Mountain Literature) but also because it’s about mountain rescue in the Cairngorms, my home mountains. 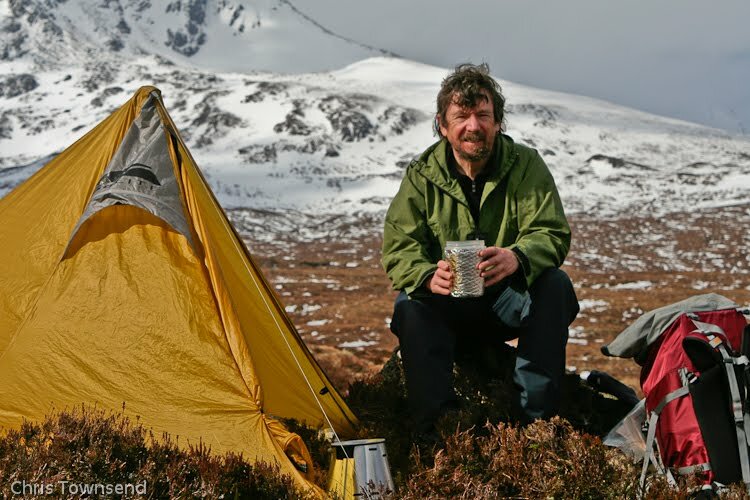 John Allen was a member of the Cairngorm Mountain Rescue team for 35 years and team leader for the last 18 of those years. Cairngorm John was his call name when talking to RAF rescue helicopters. His book describes the development of the rescue team during those years and the vital role it plays in saving lives. Many examples of rescues are given, some when lives were saved, some when they were not. Some I remember following in the news at the time. Even when I knew the outcome I found the stories gripping. The writing is both terse and stark yet at the same time conveys well the feelings of the author and the intensity of a rescue. The dedication and professionalism of the rescue team comes across clearly as well, reminding me of how lucky climbers and walkers are to have such people prepared to come out in appalling conditions to help anyone in trouble in the hills. In all cases bar one there is no criticism or condemnation of those who need rescuing. Instead there is an understanding that accidents can happen to anyone. Indeed Allen describes an accident he himself suffered – though in this case he and his companion managed to effect a self-rescue. The book is also valuable in giving a clear account of how a mountain rescue team works and the complex logistics involved. The close relationship between the civilian team and the RAF Search and Rescue teams is shown too. Anyone wanting to know about mountain rescue – even if there is no interest in the Cairngorms – will learn much from this book. I highly recommend it. At a time when the RAF Search and Rescue is to be replaced with private teams and it is unclear what will happen to the rescue centre currently based at Kinloss it should be required reading for those politicians who appear to have little understanding of mountain rescue or its importance. Photo info: Looking down into mist-filled Coire Lochain from Cairn Lochan on the northern rim of the Cairngorm Plateau. Canon EOS 350D, Canon EF-S 18-55@18mm, 1/400 @ f5.6, ISO 400, raw file converted to JPEG in Lightroom 3. High pressure in winter can often mean dull calm weather with sheets of grey cloud covering the sky. 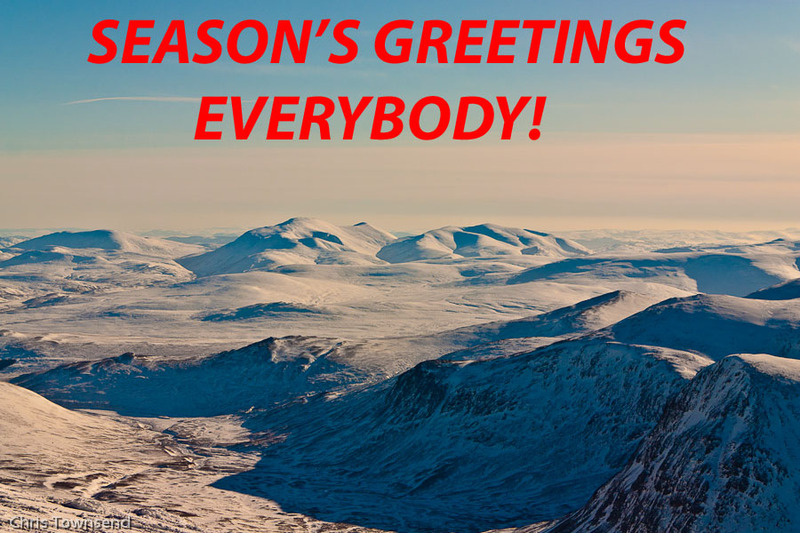 Such was the prediction for the Cairngorms a few days ago. Further west though the forecast suggested the clouds might break and allow some sun through. With that in mind I decided to head for Creag Meagaidh, a big mountain in the heart of the Highlands that I hadn’t visited for a few years. Sure enough as I drove west patches of blue sky did appear and the clouds only capped the summits rather than hanging low over the whole landscape in a sombre grey blanket as they had in Strathspey. Leaving the car I wandered through the young woodland in lower Coire Ardair, woods that have sprung up since Creag Meagaidh became a national nature reserve in 1985 and grazing by sheep and deer was reduced. Leaving the trees I followed the curving path into the upper corrie where the great cliff at its head comes into view. One of the biggest mountain cliffs in Britain the Coire Ardair headwall is a dramatic tangle of buttresses, spires, ridges and gullies. At its foot lies Lochan a’Choire beside whose dark cold waters I camped. The ground here was wet but not far above the mountainside was white with snow and when I clambered into the lower reaches of a wide gully high above the lochan I could see massive icefalls decorating the grey rock walls. That night a gentle breeze brought occasional flurries of snow and racing clouds high above meant there were only glimpses of the stars. I left the tent door open so when I woke my first sight was of the great mountain wall rising above me. 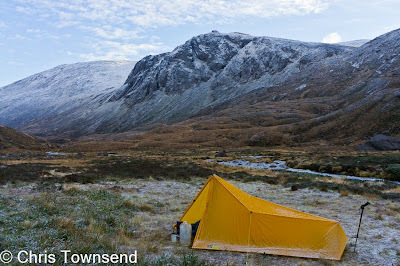 Leaving the tent I headed up to the cleft known as The Window that separates Creag Meagaidh from hills to the east. The ascent is steep in places and I was soon kicking steps in the crunchy snow. I had my ice axe ready in case of a slip but the greater danger was of going through the snow and banging my leg on a hidden boulder. Alert to this I climbed slowly, testing each foot placement. Once beyond The Window the terrain eases and I was soon on the huge plateau that stretches some one and a half kilometres from the top of the Coire Ardair cliffs to the summit of Creag Meagaidh. The wind that had whistled through The Window was gone and all was quiet and calm, the only sound the crunch of my crampons in the icy snow. 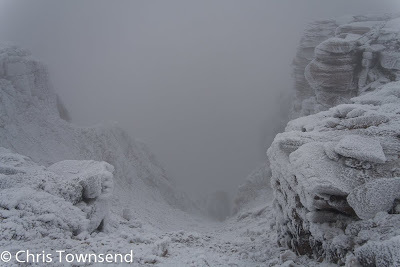 A thick mist covered the plateau and the snow and sky merged into one just a few hundred metres in front of me. Only wind blown ripples in the snow gave any definition to the ground and stopped me feeling disorientated in this quiet white-out. Eventually the summit cairn loomed up in front of me and I felt a bitter wind searing my face. The clouds swirled and broke about the mountain, suddenly revealing for brief seconds dark glens and lochs far below and distant white peaks. Occasionally the sun shone through the clouds, casting shadows on the snow, and lighting patches of hillside. I lingered in the chilly air, captivated by the magical impermanence of the light, then turned and plunged back down into the dense mist and made my way back to camp. Photo Info: Camp in Coire Ardair. Sony NEX-5, Sony 18-55 lens@18mm, 1/50@f8, ISO 200, raw file processed in Lightroom 3. Following on from BBC Scotland’s interesting Making Scotland’s Landscape TV series BBC Radio Scotland’s Out of Doors programme held a debate on Scotland’s landscape that will be broadcast this weekend. I was in the audience on behalf of the Mountaineering Council of Scotland and asked a question though this may not be broadcast as far more material was recorded than will be used. Overall I found the debate disappointing as the voice of outdoor and conservation bodies was barely heard. There was no-one representing these interests on the panel, which was dominated by the National Farmers Union and the Scottish Rural Property and Business Association, whose general line was that all was well with the landscape, which was cared for well by farmers and landowners, and that developments like bulldozed roads, pylons and wind turbines were acceptable. And anyway people would get used to them. I will be interested to hear which parts of the debate make it to the final broadcast. Note. The date of the broadcast has changed and it will now be the coming weekend, Sat 27 and Sun 28th November. Photo info: Acceptable development? 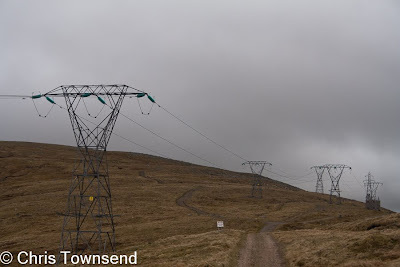 Pylons in Corrieyairick Pass. Canon EOS 350D, Canon EF-S 18-55@47mm, 1/640 @ f8, ISO 200, raw file converted to JPEG in Lightroom 3. Dawn came with a hard frost and a clear sky. The evening’s rain had frozen into hard, sharp whiteness on every surface. The ground was rippled with rock solid ice-bound mud. The forecast was good, with light winds and maybe the occasional shower predicted. The mountains shone white in the low early sun. Time, I thought, to go and see how much snow was up there. In the glen a breeze flickered, cold and piercing. Once I was on the mountain, above the trees, the wind was much stronger, sweeping chilling spindrift across the slopes, a hazy mass of moving snow slithers that undulated over the ground like water. Within half an hour of setting out I was labouring through knee-deep drifts and my hands and head were cold. I stopped to clip on snowshoes, don overmitts and pull up my jacket hood. As I climbed the wind strengthened and gusted, sometimes blasting the spindrift head height. The landscape was mobile, flowing with the wind. In lulls distant views were suddenly clear and distinct. Loch Morlich steel blue amongst the dark green of the forest. The white summit cone of Meall a’Bhuachaille a bright white above brown moorland. Then the wind whipped the spindrift up into the air and the views dissolved into indistinct and muddled shapes. Distance became hard to judge and boulders loomed up like huge cliffs. The eastern slopes of Cairn Gorm gave some protection, the full blast of the south-west wind muted by the mountain. Then on the summit all was grey and white as cloud and spindrift mingled and swirled together. The weather station came and went in the shifting mist, a rime ice plastered strangeness. The wind was bitter and powerful and I didn’t linger but continued west down from the summit. The sun was a silver orb, brightening and dimming as the clouds shifted. For brief moments the Northern Corries appeared under a blue sky. Then I was back in the icy air, struggling to stay on my feet and not be blown over the rapidly growing cornice into Coire Cas. Struggling on into the wind seemed both unwise and unpleasant so I dropped down into calmer air and gentler weather. Back down in the glen the sun shone and the pines hardly moved in the breeze. The white mountains looked calm and serene with soft white clouds drifting over the summits. But up there, I knew, it was a real winter’s day. Photo Info: Top: Cairngorm Weather Station. Bottom: Across the Northern Corries from the western slopes of Cairn Gorm. November 15, 2010. Sony NEX-5, Sony 18-55 lens@52mm & 18mm, 1/4000@f9, ISO 800, raw file processed in Lightroom 3. After a week of dreich weather the forecast suggested there might be a short window in the storms with an afternoon mostly free of clouds followed by a frosty night. Not having been camping since my return from the Pacific Northwest Trail a month ago I was keen to spend a night in the wilds and this seemed a good opportunity. 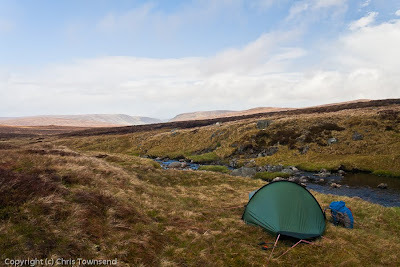 For my first wild camp back in the Highlands I wanted to be somewhere special. The image that came immediately to mind was that of the magnificent cliff-ringed bowl at the head of Loch Avon in the Cairngorms so it was there I would go. I set off in drizzle with the hills draped in thick mist hoping the forecast was accurate. Soon I was in the clouds but being on familiar ground I didn’t need map or compass. The ground was sodden from recent rain and the burns were racing down the hillsides. A steep, rough, eroded path led down out of Coire Domhain and out of the mist. Below me boulder-strewn slopes stretched out to long Loch Avon. The Feith Buidhe and Garbh Uisge burns roared down the ragged hillside between the big cliffs to merge into a whitewater stream that raced through the little meadows and heathery knolls of the corrie floor to the loch. Down by the stream I sought a dry camp site but everywhere flat oozed water at every step. Choosing the least squelchy spot I could find I pitched the tent. Thin but wetting drizzle filled the air. Soon I was inside and dry and warm in thick clothing and sleeping bag with water heating on the stove for a mug of hot chocolate. The temperature was +4ºC. Heavier rain and an increasingly gusty wind kept me in the tent reading all evening. So far the weather forecast was looking badly wrong. During the night I was woken several times by blasts of wind shaking the tent and by drips of condensation shaken off the fabric onto my face. At 4.30 a.m. I noticed that the ground round the edge of the tent porch was white. The rain had turned to snow. The wind was also waning and I didn’t wake again until 7.30, when the eastern sky was glowing with the dawn and there were stars high above. Only a few thin clouds remained. A light splattering of wet snow covered the ground, the edges of the tent were frozen and there was ice in my water bottles. The temperature was -1ºC and the air was crisp instead of soggy. Watching the wild landscape come to life as the light strengthened was the highlight of this short trip, the time when I was glad to be out there, glad to be a witness to a new day in the mountains. By the time I left, after a few hours of scenery watching and photography, the sky was clouding over and the brightness had died away. The break in the stormy weather had arrived in the early hours of the morning and was slipping away by midday. 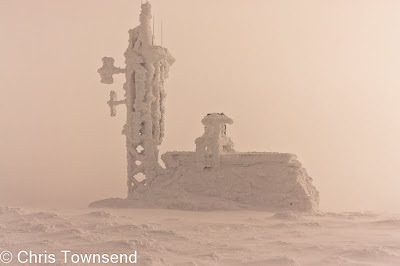 By the time I had climbed back up to the Cairngorm Plateau I was in clouds again. By early afternoon the rain had returned – and I was in a café in Aviemore looking out at the busy streets. Photo Info: Early morning at the camp in the Loch Avon basin. Sony NEX-5, Sony 18-55 lens@22mm, 1/125@f8, ISO 250, raw file processed in Lightroom 3. The latest issue of TGO – December 2010 - has just been published. There’s an illustrated excerpt on the Cairngorms from my new Scotland book with an introduction about how I came to be so involved with the Scottish mountains and what writing the book involved. 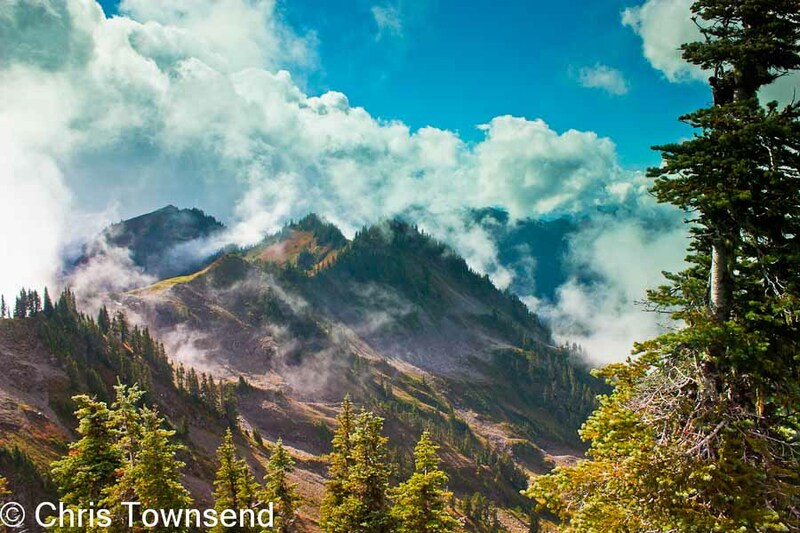 My Backpacking Column covers the Cascade Mountains section of my Pacific Northwest Trail walk. Since my return from the trail I’ve begun gear testing again and this issue has my first post-walk review, covering Petzl’s innovative Core USB rechargeable battery and programmable headlamp. Elsewhere in gear John Manning looks at 13 insulated hats – a good topic for the time of year and which reminded me to look out my Lowe Mountain Cap, Judy Armstrong reviews 15 pairs of waterproof overtrousers, Cameron McNeish praises Vaude’s ultralight Power Lizard tent and Eddy Meechan is taken with Terra Nova’s ultralight Cuben Fiber Ultra 20 pack. Also in this issue Vivienne Crow looks at how repairs to the Lakeland fells are progressing a year after the 2009 floods, Cameron McNeish praises smaller hills, Emily Rodway meets walking artist Hamish Fulton, Dan Bailey explores the landscape between the Lake District and Yorkshire Dales National Parks, Stephen Venables follows in the footsteps of the great mountain explorer Eric Shipton, Carey Davies meets the mountain measuring men of G&J Surveys and Jim Perrin celebrates Cwm Pennant. There’s a reader survey too so you can tell the editors what you think of the magazine. Photo info: Mount Baker in the North Cascades during the only 12 hours of sunny weather I had in ten days.. Canon EOS 450D, Canon EF-S 18-55 IS@55mm, 1/250 @ f8, ISO 200, raw file converted to JPEG in Lightroom 3. 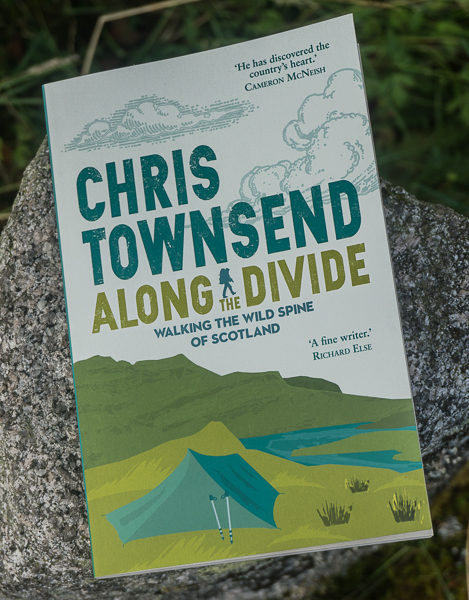 "Chris has the knack of using just enough words to give us a proper flavour of the place ...... this is a book that should grace the bookcases of all hillwalkers and mountaineers that love the hills of Scotland." "set to become the definitive resource ..... in its own way an object of beauty and desire .... absolute essential for anyone with even a passing interest in Scotland's mountains and the default bookshelf reference work for at least a generation". I feel somewhat overwhelmed by these reviews! They make all the hard work that went into the book really worthwhile. Update: a short review has appeared in Walk, the Ramblers magazine. The reviewer says "it’s an invaluable planning tool and inspiration for Scottish hillwalkers". Update Dec 8: My old friend Cameron McNeish has reviewed Scotland for the Strathspey and Badenoch Herald, saying "this is a book that will thrill newcomers to the Scottish hills while at the same time give great satisfaction to those of us who are a little bit more long-in-the-tooth and will undoubtedly find many nuggets of information." Thanks Cameron! Update: Dec 21. Another nice review on Outdoors Magic - "A cracking book that should be on every mountain walker and mountaineer's book shelf." Update: Dec 28. Good detailed review on Hendrik Morkel's excellent Hiking in Finland blog. "After I got the book I wasn't able to put it back down........mandatory for all those who plan to spend time outdoors in Scotland". 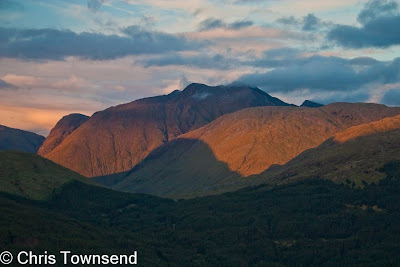 Photo info: Bidean nam Bian at dusk. Canon EOS 300D, Canon EF-S 18-55@55mm, 1/100@f5.6, ISO 400, raw file converted to JPEG in Lightroom 4. I've just been interviewed about the Pacific Northwest Trail by Jörgen Johansson for Fjäderlätt.se. You can read the interview here. Fjäderlätt is an interesting site as it's about lightweight backpacking but from a Swedish rather than an American perspective. No hot deserts or sunny Californian mountains here. That said, the last month of my PNT hike was more like hiking in Scandinavia or Scotland than any other walk I've done in North America with rain and low clouds most days. 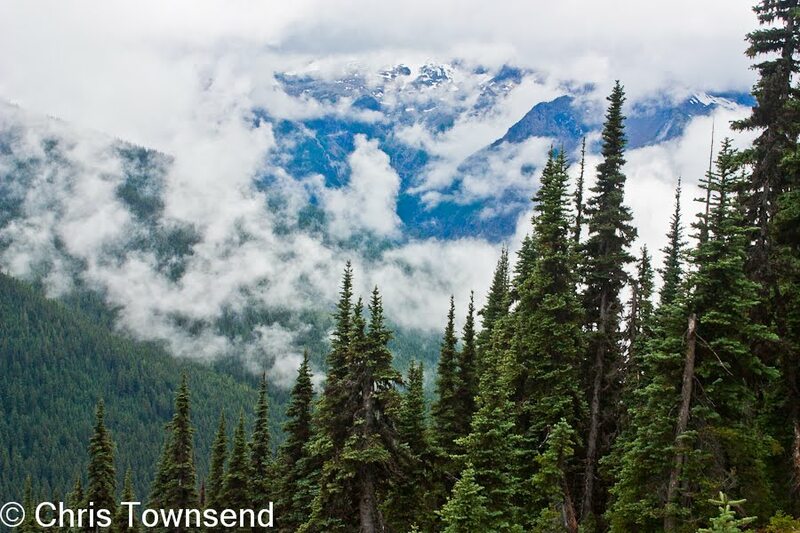 Photo info: A rare sight in the North Cascades during my hike - a mountain almost appearing out of the clouds. Canon EOS 450D, Canon EF-S 18-55 IS@36mm, 1/250@f8, ISO 200, raw file converted to JPEG in Lightroom 3. Long distance walks in wild country can take their toll on bodies and equipment. On the Pacific Northwest Trail it was my camera gear that suffered most, with one camera failing completely and the lens on the other losing a major function. Before the walk I had considered buying one of the new smaller cameras, known variously as interchangeable lens cameras (ILC) or micro systems cameras (MSC), such as the Sony NEX 5, Panasonic GF1 or Samsung NX10, that produce the same quality images as DSLRs in order to save weight. However I decided that, quite apart from the extra cost, I’d rather have cameras with which I was familiar and wouldn’t have to think about during the walk so I took my Canon 450D DSLR plus my Sigma DP1 digital compact as a back-up. To keep the weight down I took just one lens with the Canon, an 18-55mm zoom. Both cameras were well-used before the walk, too well-used it seems, given what happened. The DP1 lasted just ten days before the lens stuck in the open position and the whole camera froze. Fresh batteries made no difference. The camera was dead. I did have a camera on my HTC Desire smartphone that would do as a back-up though I doubted the results would be very good. In fact, although nowhere near the quality of the 450D or DP1, the phone camera images looked fine on the web and when printed fairly small in TGO magazine. Using the camera quickly depleted the battery though so I didn’t take many pictures with the phone. The Canon worked fine for the first half of the walk and then the autofocus on the lens started malfunctioning before failing completely. I then had to use manual focus, which was difficult due to the very narrow and very sensitive focusing ring. I had no choice but to persevere with this for the rest of the walk but I knew I would have to replace the lens. Apart from anything else in cold weather manual focusing with cold fingers or when wearing gloves would be just about impossible. So back home I was faced with the choice of repairs or replacement. The DP1 went to Sigma who quoted £125 to repair it. As the DP1 was a discontinued model with much I didn’t like about it and I could buy the improved DP1s for £100 more I felt reluctant to pay to have it mended. A new Canon lens would cost around £100. As I’d now gone through two of these kit lenses in five years I didn’t expect a replacement would last long. So, £225 to keep the old cameras going. The alternative was to buy a replacement camera for the DP1 that had an 18-55mm lens or equivalent. At this point I’d never actually seen any of the ILC cameras except in pictures. Before making a decision I wanted to handle them so I was pleased to discover that Jessops in Inverness stocked virtually every model. Just viewing the cameras proved instructive. Although I’d seen pictures of them next to DSLRs they were still smaller than I’d realised. Holding them was also instructive. In the hills I want a camera that feels secure in the hand and that I can grip firmly while taking photos. One of the cameras was rejected immediately. It actually felt slippery, the slight curve of the grip seeming to have been designed for your hand to slide off. The models that look like mini DSLRs did have positive hand grips but these were also the bulkiest and heaviest ones. Of the compact style models the Sony NEX 5 had the best grip. It was also the smallest. And in lab tests it had excellent dynamic range – better in fact than many DSLRs including the 450D as well as all the other ILCs. As dynamic range is important for outdoor photography where bright skies and dark foregrounds are common this was a big plus point. The one drawback was the lack of a viewfinder. There’s not even an electronic one available as an extra. I didn’t like the idea of holding the camera out in front of me and trying to keep it steady in the wind or in low light. However the NEX 5 has a tilting screen and I realised I could hold it by my chest with my arms tucked in, which should be as steady as holding it to my eye. The metal-bodied NEX looked pretty solid too and the metal 18-55 lens looked much higher quality than the plastic Canon one. After a few days pondering the decision was made and it was back to Jessops for an NEX 5. Replacing the DP1 with the NEX 5 means that the 450D will now be used with my 11-18 and 55-250 lenses and carried when weight isn’t too important. Eventually I may replace it with another NEX model and lenses, which will cut weight further. As it is, the NEX 5 plus 18-55 lens weighs 520 grams while the Canon 450D plus 18-55 lens weighs 786 grams and is considerably bulkier. So far the NEX 5 has only been used on a couple of short walks in dull weather and I haven’t made a direct comparison with the 450D. However the first images suggest that the quality is at least as good as the Canon at low ISOs and much better at high ones. I think I’m going to like this camera. And I’m sure I’m going to like the low weight and bulk. The NEX 5 could be the ideal backpacking camera. 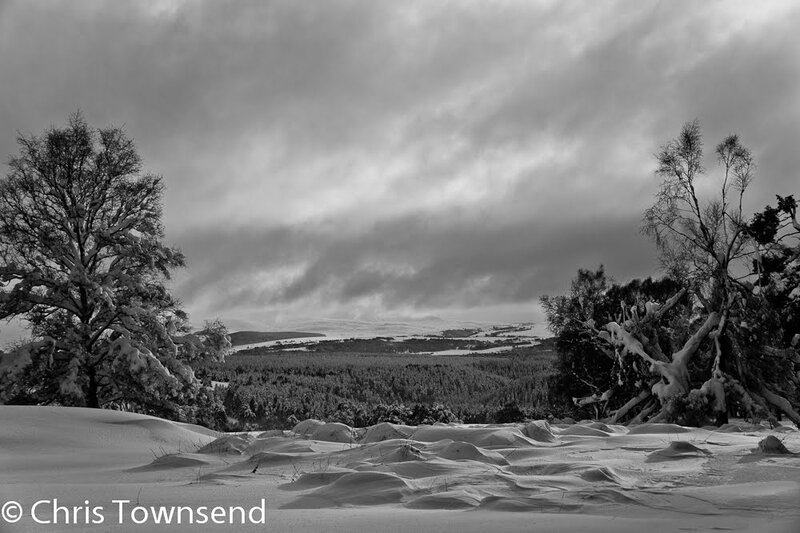 Photo Info: Top: Anagach Woods, Grantown-on-Spey. Sony NEX-5, Sony 18-55 lens@18mm, 1/60@f3.5, ISO 250, sweep panorama function, JPEG tweaked in Lightroom 3. 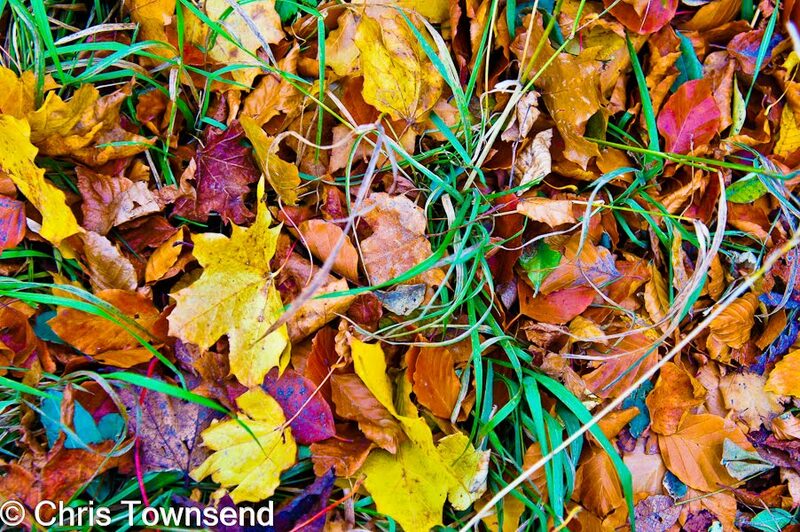 Bottom: Autumn Leaves. Sony NEX-5,18-55 lens@44mm, 1/50@f5.6, ISO 400, JPEG tweaked in Lightroom 3. Dreich weather with low cloud and rain squalls over the last few days have kept the world grey and sombre and provided little incentive to venture outdoors. Yesterday however the clouds thinned for a few hours, allowing bursts of sunshine to light the autumn trees and bring colour to the woods and hills. The high Cairngorms remained hidden, the cloud only rising just enough to show snow on the lower flanks of Bynack More and Cairn Gorm. Across Strathspey the lower Cromdale Hills and distant Ben Rinnes shone white with fresh snow. I wandered through the local woods, where the birches glowed gold. A lone buzzard circled above the woods, mewing loudly. In every dip and hollow the ground was sodden, saturated by the recent rains. There was no wind and the woods were silent apart from my boots rustling the fallen leaves and squelching in the mud. In the sunshine it was warm but in shaded areas the cold had me zipping up my jacket and thrusting my hands in my pockets. When the storms cease this is a glorious time of year, a period of brightness and beauty before the winter sets in. 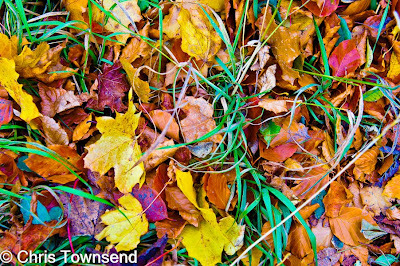 Soon the leaves will fall and fade, shredding the land of colour ready for the monochrome of winter. 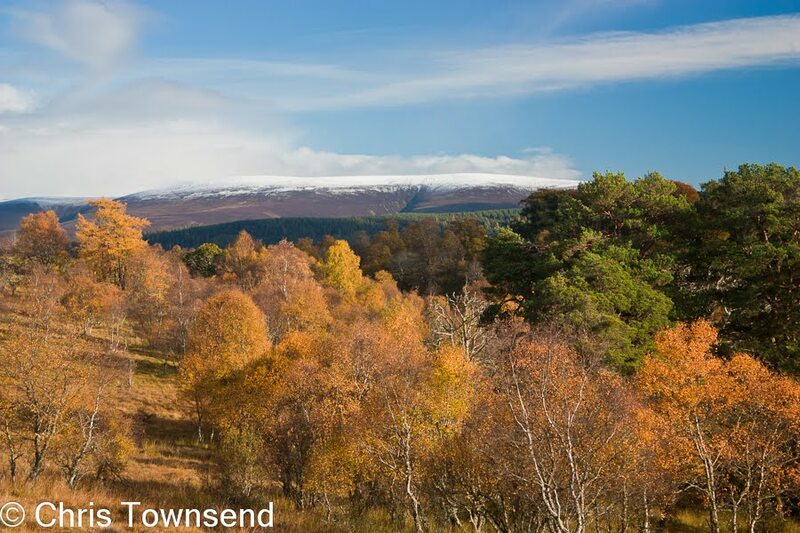 Photo Info: The photos show Ben Rinnes (top) and the Cromdale Hills rising above the Strathspey woods, October 23, 2010. Both photos: Canon EOS 450D, Canon EF-S 18-55 IS@55mm, 1/320 (top) & 1/100 @ f5.6, ISO 200, raw file converted to JPEG in Lightroom 3. 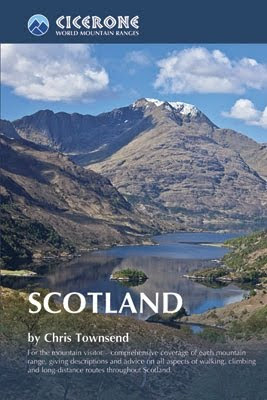 My latest book is just out – “Scotland” in Cicerone’s World Mountain Ranges series. It’s a big book – 557 pages - covering all the Scottish hills from the Southern Uplands to the Outer Hebrides and illustrated with hundreds of my photos and some excellent maps put together by Cicerone. “Scotland” is the product of seven years of research, writing, photography and hillwalking, far longer than I expected it to take. My opinion on how much I knew about the Scottish hills turned out to be completely wrong! The writing and photography are my own but I do owe Cicerone my thanks for the work they have put into the book. I think it looks excellent and I’m very pleased with it. I hope others like it too and find it interesting and useful. You can see details of the book on the Cicerone website here. 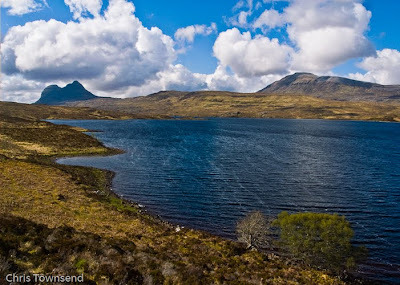 Photo Info: The cover photo shows Ladhar Bheinn and Loch Hourn. Canon EOS 450D, Canon EF-S 18-55 IS@55mm, 1/100 @ f5.6, ISO 100, raw file converted to JPEG in Lightroom 2. Even after a summer long trip it doesn’t take long before I feel the need to walk in wild places again. 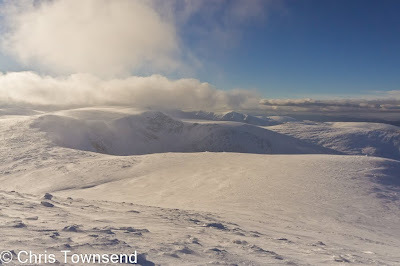 So ten days after returning from the Pacific Northwest I took a day out from clearing the backlog of work and headed for my local hills, the Cairngorms. After a week of low cloud and occasional rain the forecast was for a day of sun and clouds with good visibility after which the stormy weather was predicted to return. My favourite walk in this area, one I do several times a year, is across the great Cairngorm Plateau to Ben Macdui. There are many possible variations to this walk. Back in June on a two day trip - the last one before I undertook the Pacific Northwest Trail – I’d climbed to the plateau from Loch Avon and descended into the Lairig Ghru. This time I stayed high throughout, crossing the plateau from Lurchers Gully and returning via Stob Coire an t-Sneachda. I set off in drizzle with swirling clouds on the tops but within half an hour a bright sun was shining hazily through thin clouds and I had my sleeves rolled up and dark glasses on. The clouds rose above the tops and the visibility was indeed good, as promised, though the light was flat and dull. Even so the tremendous power of this vast mountain landscape made me feel intensely pleased and grateful to be there. Every time I return from a venture to higher mountains and more remote wild country I wonder if the hills of home will have the same effect on me, will seem as grand and impressive. They have never failed to do so yet but I don’t take them for granted. If I did I suspect that one day I would be disappointed. As so often the final hours of the day saw the light change and give a last burst of beauty and colour before the darkness came. I had already started for home when I saw the clouds clearing and blue sky appearing. Knowing that at this time of year the low afternoon sun shines along Loch Morlich, lighting the water, the woods along the shore and the backdrop of hills, I stopped for a stroll along the lochside. By luck rather than intention I’d timed it perfectly. The sun was slanting across the hills, which were reflected in the calm water along with the woods on the far shore, where the gold of autumn birches stood out against the dark green of the pines. Drifting clouds added to the depth and complexity of the scene. The lovely light didn’t last long as the angle of the sun soon meant the hills were dark and a breeze sprang up and ruffled the reflections. For a few minutes though all had been perfection. The hills had welcomed me home. 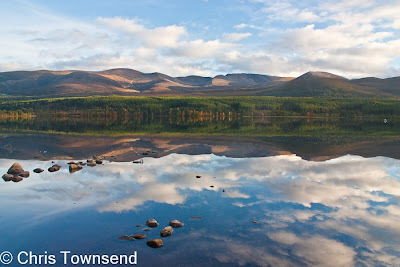 Photo info: Loch Morlich & the Cairngorms, 16th October 2010, Canon EOS 450D, Canon EF-S 18-55 IS@18mm, 1/25 @ f5.6, ISO 200, raw file converted to JPEG in Lightroom 3. A week after returning home from the Pacific Northwest Trail my summer adventure is already fading into the past. Dealing with a failed hard drive (the one with the operating system of course) and the aftermath of restoring files and software has proved an unwelcome distraction. Downloading my images has been welcome, though seeing the images on screen further confirms that it really is over. Reports on the trail will continue though. Long reports are being published each month in TGO, the first ones in the October and November issues. I’ll be describing how my gear performed in a feature in the January issue too. Short versions of these articles plus the videos I made before the walk can be seen on the TGO website. There’s also a gallery of images, all taken with my phone camera, on my Facebook page. Photo Info: Photo info: Clouds & Sun in the Five Lakes Basin, Olympic National Park. Canon EOS 450D, Canon EF-S 18-55mm IS@18mm, 1/250@F8, ISO 200, raw file converted to JPEG in Lightroom 3.2. 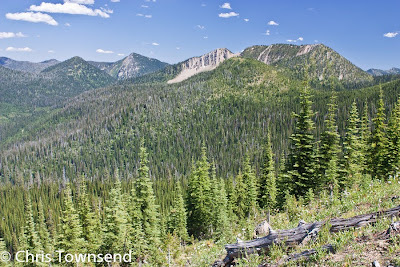 The last nine days of my Pacific Northwest Trail hike encapsulated the walk as a whole. I had days of sunshine and days of torrential rain, dense clouds hiding the peaks and clear skies with sharp distant horizons. 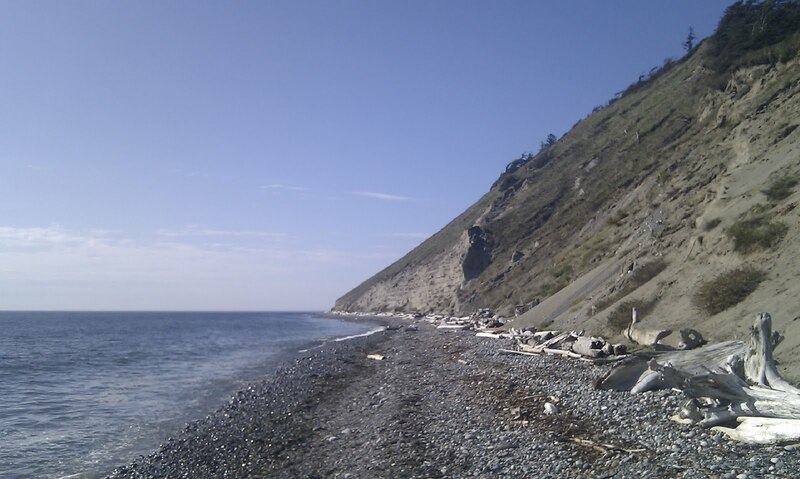 I walked on busy highways, logging roads, remote trails and, on the coast, tough trailless terrain. 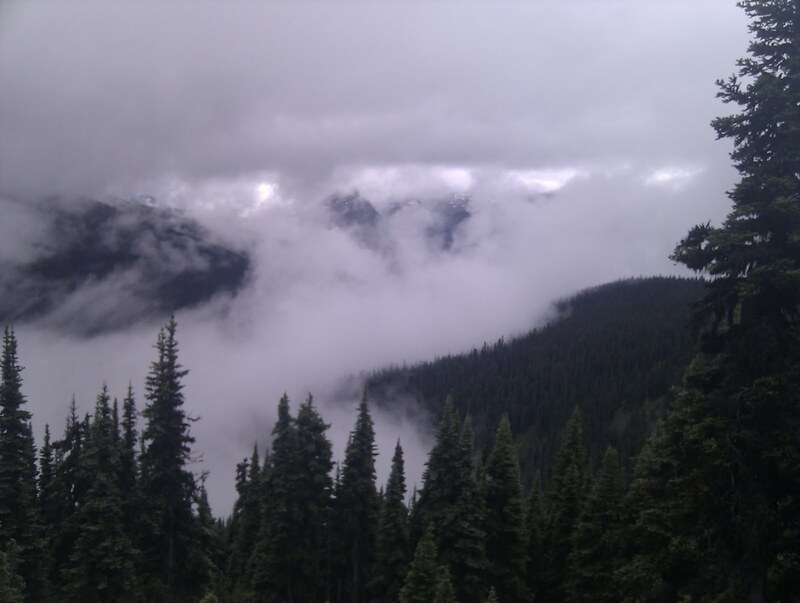 The Olympic Mountains came and went in the mist, though Mount Olympus itself remained hidden. 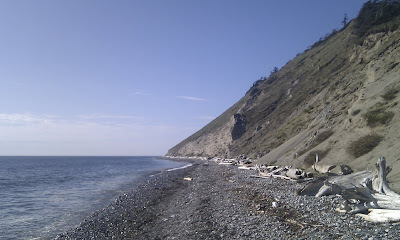 Along the ocean I scrambled over boulders, seaweed and big logs and strode along sandy beaches. I camped in the majestic giant trees of the Bogachiel rain forest and on the edge of the Pacific Ocean. Finally I reached Cape Alava and the wonderful adventure was over. Both sad and elated I turned away from the trail. It was time to go home. The picture is at trail's end at Cape Alava. There are more pictures on my Facebook pages and TGO magazine is running a series of longer articles on the walk. The area between the Cascades foothills and the Olympic Mountains is a mix of roads, towns, industry, farmland, islands, beaches and forests. The PNT threads a way through this varied terrain, sometimes on trails, too often on highways, some of them very busy. There are some attractive sections - Deception Pass State Park, the Bluffs Trail on Whidbey Island - but this hasn't been a memorable part of the walk. It finishes with the ferry to Port Townsend on the Olympic Peninsula. From here I head back to the mountains and then the Pacific coast and the end of the trail. Sitting in a motel in downtown Sedro Woolley I'm looking out at grey skies, rain and the ragged edge of clouds shrouding the mountains. This has been the norm for the past 12 days with one glorious exception. The long hot days in the Purcells and Selkirks seem like another time now, another walk. Initially the climb out of the sagebrush of the Okanagon to the Eastern Pasayten Wilderness was in sunshine and I had excellent views of the isolated easternmost outliers of the Cascades, especially the dramatic rock pyramid of Cathedral Peak, and on one long high level traverse I could see the long line of the main Cascades shining in the sun. 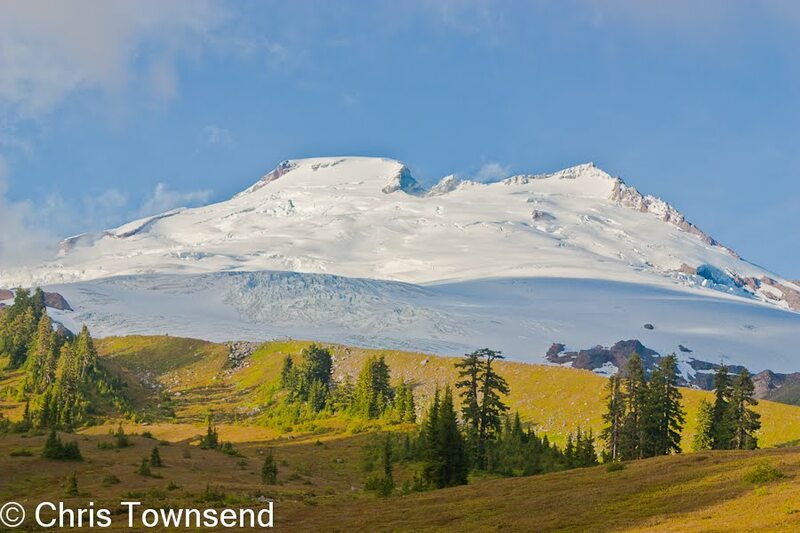 But once I crossed the Pasayten River and had climbed towards the main crest of the Pasayten, along which runs the Pacific Crest Trail, the clouds, rain, and, initially, snow closed in. Day after day I woke to mist and wetness. 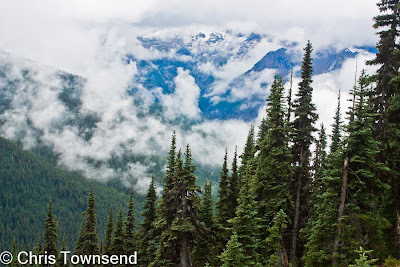 I traversed the crest, descended to Ross Lake and hiked through the North Cascades National Park (where I did enjoy the massive trees along Big Beaver Creek)with only occasional glimpses of the mountains. Then on the last day before I left the Cascades behind the skies slowly cleared to reveal the shining white dome of Mount Baker, northernmost of the great Cascade strato-volcanoes. I camped beneath the mountain and woke to a glorious view. Then it was down into the forest and back into the rain. The final two weeks will see me on the coast and crossing the Olympic Mountains. Maybe the weather will improve. 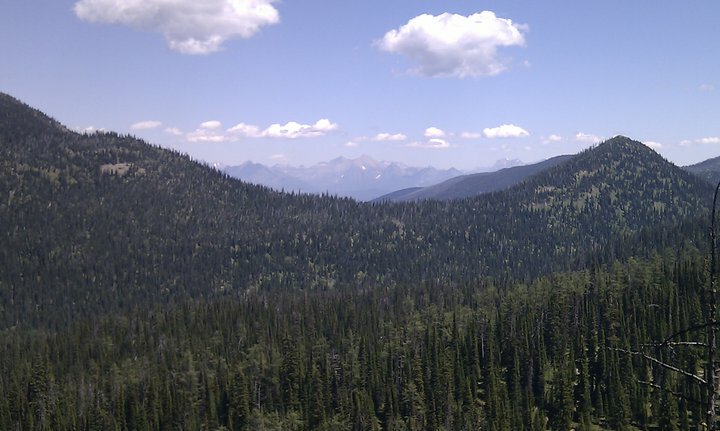 For the last nine days I've wandered through the pleasant though cow-infested and rather waterless Kettle River Range, where there are some good trails and scenic camp sites but also a fair amount of road walking, and then the lower sagebrush dotted Okanagon, where it's hot and dusty. Ahead though lie the North Cascades and the longest stretch of high mountain wilderness on the whole trail. After resupplying here in Oroville, and enjoying some fresh food (and beer! ), I'll be heading into the Cascades for 150+ miles. Between my resupply points of Bonners Ferry and Northport (where I am staying at the wonderful Matteson's B&B)lie the Selkirk Mountains. These rocky granite hills are rough, dramatic and grand, the wildest and most spectacular landscape since Glacier National Park at the start of the trail. They are little visited - in ten days I saw just two other backpackers and a few day hikers near roadheads - and the trails are rugged, steep and often brushy and hard to follow. In places they fade away altogether and bushwhacking is the only option. Above timberline this is relatively easy, just a question of finding a way across gnarled whitebark pine and juniper dotted granite boulders and scree. Below timberline bushwhacking is just that, a desperate thrash through dense head high tangled undergrowth. Unable to see my feet much of the time I stumbled and tripped over rocks and logs. My trekking poles helped keep me upright, except when they became entangled in branches and bushes. When possible I followed faint animal trails - made by bears or moose or elk - but these never went my direction for long. The day I spent mostly bushwhacking it took me 101/2 hours to progress 10 miles and I made camp exhausted, scratched, bruised and feeling as though the forest had just chewed me up and spat me out. I was thankful that most days were not like that. Afterwards the next standard forest trail seemed like a groomed city park path. I climbed several summits, the highest of which, and the highest of the walk so far, was 7308 foot Abercrombie Mountain. This is a slate and shale mountain on the western edge of the Selkirks with a fine rocky summit and an extensive view of hills and forests fading into the distance in every direction. From this summit I have come down to just 1200 feet and the Columbia River, beyond which lies the gentler Kettle River hills, where I head next. Between my resupply points of Eureka and Bonners Ferry I crossed the steep, rugged Purcell Mountains and left Montana for Idaho. The Purcells are mostly wooded though there are some open areas with views. Trails are often sketchy and there are few signs so careful navigation is required in the dense forest. My compass has seen much use. Water and camp sites are rare on the steep slopes. I've carried more water than expected and squeezed the tent onto some tiny sites. But that's all part of the adventure. Ten days into my Pacific Northwest Trail hike and I've crossed the Rocky Mountains. The first five days were in the glorious rock and ice scenery of Glacier National Park. There the trails are maintained, backcountry camp sites have to be booked inuyb advance, and a permit listing many conditions is required. 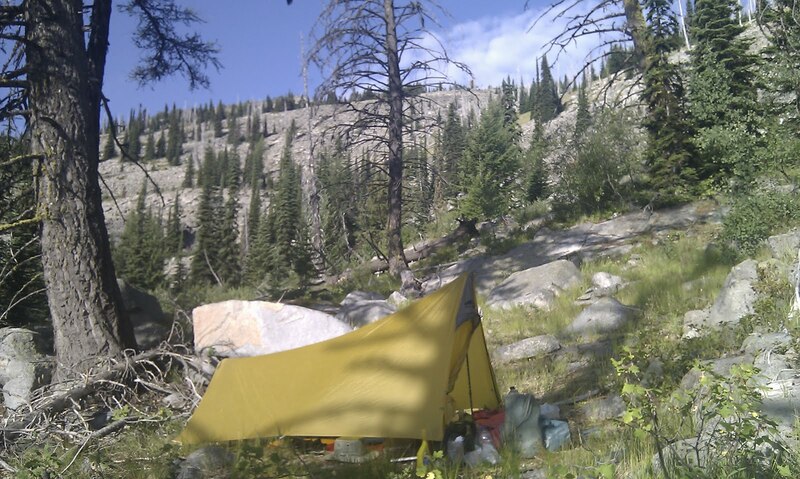 The mountains are busy and I met many hikers and at least one ranger every day and camped with others every night. I loved the landscape but it did not feel like a wilderness trip, though a tremendous thunderstorm on day four did add a little excitement. Then I left Glacier for the Whitefish Mountains, via the entertaining and friendly hamlet of Polebridge. Suddenly there were no rangers, no permits, no camp sites and no other hikers. I had the wilds to myself. The trails were often overgrown, sometimes hard to find and I had to hunt out camp sites in the dense forest. The hills were lower than in Glacier but felt wilder. 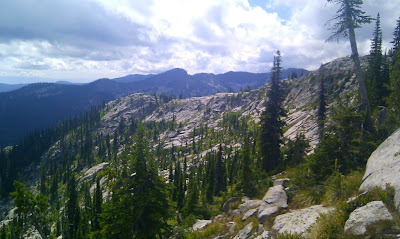 The weather went from thundery to heatwave and there was little water on the long ridges followed by the Whitefish Divide and Highline Trails. By the time I dropped down to the Tobacco Plains and the little town of Eureka I felt the walk had really begun. Next comes a week in the even wilder Purcell Mountains. 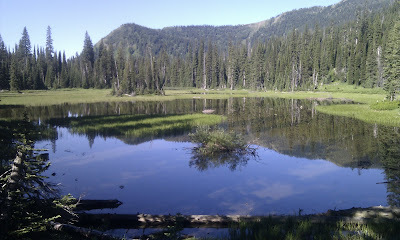 More updates from the Pacific Northwest Trail on twitter. 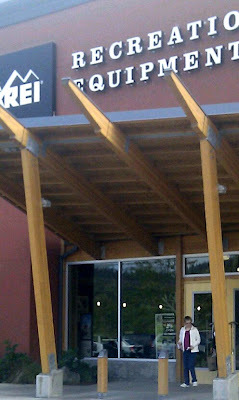 Issaquah on warm summer evening. Two days of sorting supplies, last minute planning and walks in the lovely forests of the Issaquah Alps. Two young black bears watched us from the trees today. 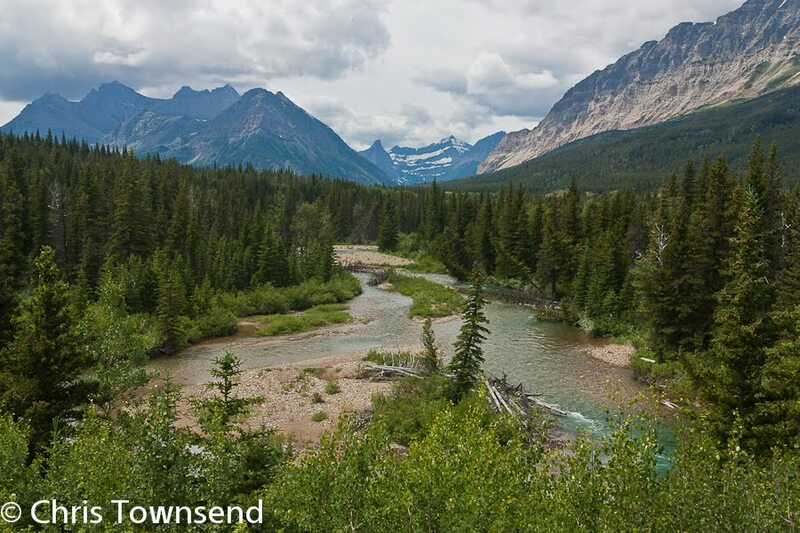 Tomorrow the long drive east to Montana and Glacier National Park with my cousin and her daughter. Then the walk begins. All photos with my Pacific Northwest Trail reports are taken with the HTC Desire phone. Many years ago I spent a rather wet summer hiking south to north through Norway and Sweden. I never wrote much about this walk - just one magazine article as far as I remember - as there was little interest in it despite it passing through some of the wildest and most spectacular landscapes in Western Europe. Nowhere else in our crowded continent can you walk 2200 kilometres in roughly a straight line and be in wild country most of the time. Publishers however did not find Scandinavia interesting and where the Yukon was seen as romantic and the Munros as popular, and so my long walks in both worth books, Norway and Sweden were seen as unknown and dull. I had thought the walk long forgotten until a Swedish backpacking acquaintance, Jörgen Johansson, contacted me to say he'd mentioned it to members of the Nordic Lightpacking group on a recent meet and they were interested to know more about my trip. An interview followed and can be found on Jörgen's site here. The Nordic Lightpackers know now that this was not a lightweight trip! Photo info: the walk took place long before digital cameras and I've never scanned any of the slides I took so I have no digital images. 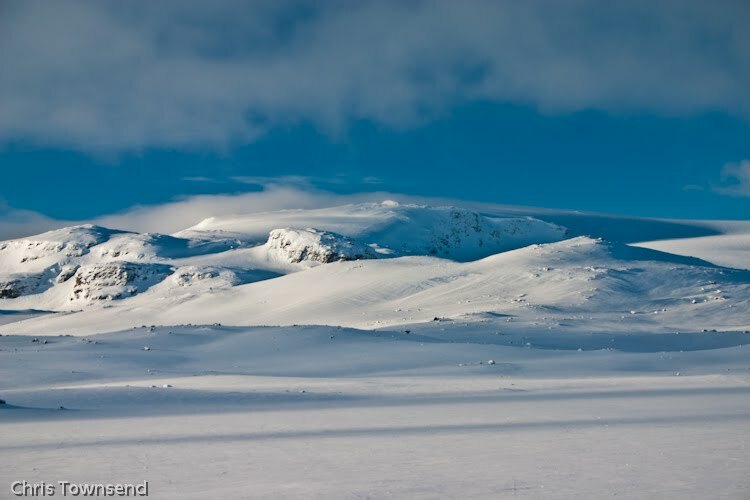 Instead here's a winter picture of the Hardangerjøkulen, an ice cap in southern Norway that I walked below and which I have skied up on several occasions. Canon 300D, 18-55mm lens @45mm, 1/125@f8, ISO 100, raw file processed in Lightroom 3. In the latest TGO (August issue, just out) my backpacking column is about the gear I’ll be taking on the Pacific Northwest Trail, which I’ll start hiking in less than two weeks. I also review 15 sleeping mats, including several interesting new models. Outdoor beds are becoming more comfortable and lighter weight, which is excellent. Elsewhere in gear John Manning reviews 15 pairs of shorts while in his Lighten Up column Eddy Meecham looks at ukuleles for backpacking! There’s much of interest in this issue – the first under the editorship of Emily Rodway. Cameron McNeish, now freed to be Editor-At-Large, has a new column and begins by discussing walking barefoot, which should provoke some reactions. Emily herself interviews Eric Robson about the enduring appeal of Alfred Wainwright. In Peaks of Experience, Andrew Terrill captures well the special joy of his first ever backpacking trip. Other articles include Ian Johnson on little-known Bretherdale in Northern England; Bernard Newman on returning to the hills after a climbing accident with a scramble up the magnificent Forcan Ridge on The Saddle in the Western Highlands; Ed Douglas on Welsh lichens expert Ray Woods and the need for protection for the “Celtic rainforest” and Cameron McNeish trekking in the desert mountains of Jordan. In his column Jim Perrin conjures up the ghost of Edward Abbey and dreams of direct action against the despoliation of the Rhinogydd in Wales by signposts, plaques, bridges and duckboards. That might provoke a response too. Photo info: With the Shangri-La 1 tent and Caldera Cone stove in the Glen Affric hills. Canon EOS 350D, Canon 18-55 at 55mm, 1/800@f8, ISO 100, raw file converted to JPEG in Lightroom 3. Wild land has been diminishing in Britain for many centuries and there is now little remaining. Yet protection for wild land is poor and more is lost every year. Scottish Natural Heritage says that the amount of land in Scotland unaffected by visual intrusion from built development fell from 41% to 31% between 2002 and 2008. 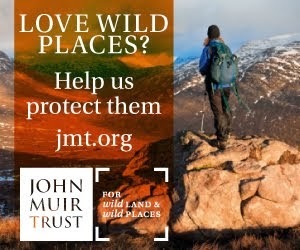 The John Muir Trust, as part of its Wild Land Campaign, has launched two petitions, one to the UK Parliament and one to the Scottish Parliament, calling for greater protection for wild land. Information can be found here. Please sign these petitions and promote them to others. 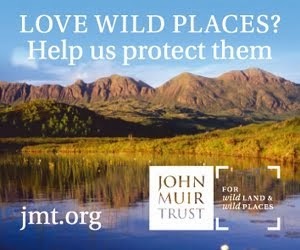 We need to show politicians that there are many of us who are passionate about wild land and concerned for its future. Clayton Kessler recently interviewed me for the website TracksandTrails.ca and this has just been published here. In the interview I talk about how I became involved in the outdoors, my favourite places, meeting bears, getting lost, long distance hikes and favourite websites and stores. 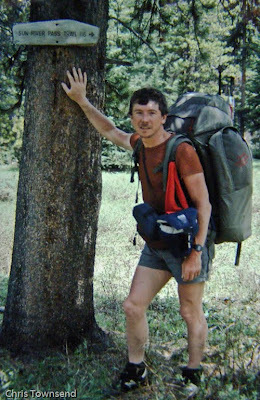 Photo info: In the Montana Rockies on the Continental Divide Trail, 1985. Pentax MX, Tamron 35-70 lens, Kodachrome 64 film. No exposure details. Scanned slide tweaked in Lightroom 2.5.